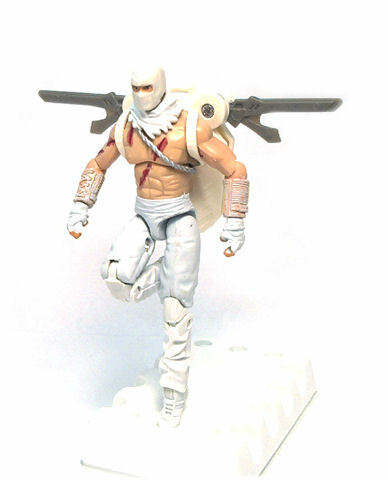 However, if you are expecting a cold-weather equipped figure like that of Arctic Assault Snake Eyes, you’d be quite disappointed, because this Storm Shadow is depicted wearing only his pants, his ninja mask and very little else. This figure is a kit bash from a couple other versions of the character. 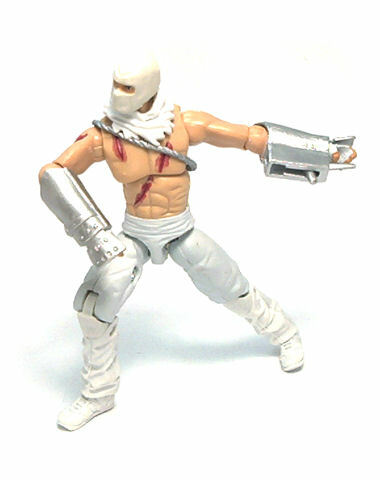 The legs are pretty much the same sculpt as the ones from the Paris Pursuit Storm Shadow figure, while head and hands are taken from the Ninja Mercenary version. The bare torso, arms and waist all seem to be newly sculpted pieces, though. 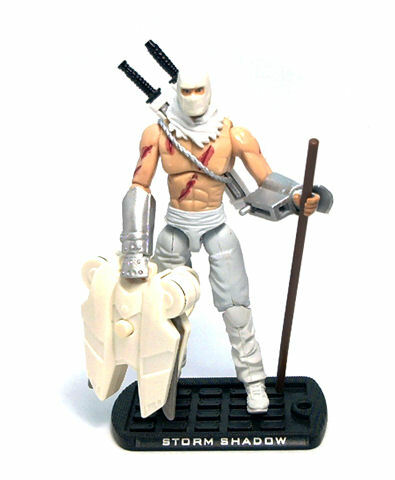 As usual, Storm Shadow doesn’t require a lot of paint operations to look good. 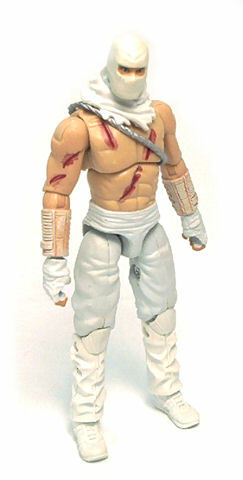 The most striking feature of this version of the Cobra ninja is the bloody scars applied to his torso and arms. None of these are actually sculpted onto the plastic, but painted in a fairly effective way. The rest of the outfit remains unpainted in the off-white color of the plastic it is made from. • Backpack with spring-loaded, pop-out silver blades. Even though some of these accessories (specifically the left hand gauntlet) border on the silly side of weaponry, overall the gimmicks work fine, and even the backpack looks like something that actually belongs in the G.I. Joe Universe, although not necessarily as a weapon, but as a flight pack. As with any other figure in this line, a black display base is also included, done in the RoC style and with the character’s name printed on the front bevel. 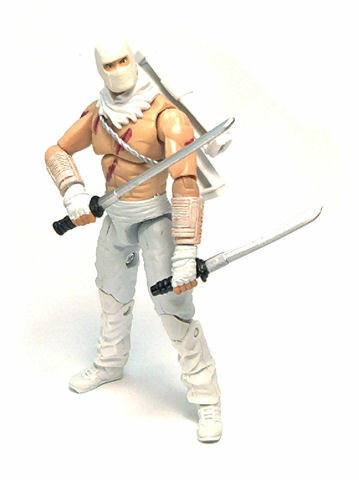 Out of the different Storm Shadow versions released for the movie line, I think this one is my favorite because it is the one closer to the original concept for the character. 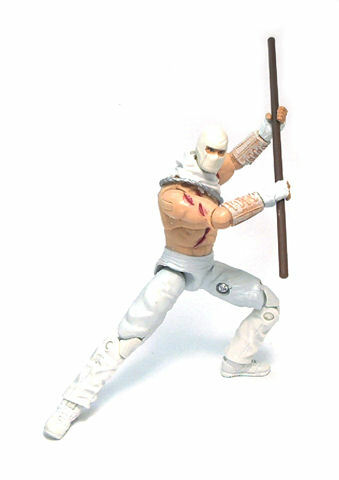 Both the Paris Pursuit and the Ninja Mercenary versions are a bit too trendy to really fit in with the ninja theme, while this Arctic Assault Storm Shadow really embodies the spirit of the character from the comic books. I was trying to figure out if those packs are suppose to be the movie equivalent of the Claw.